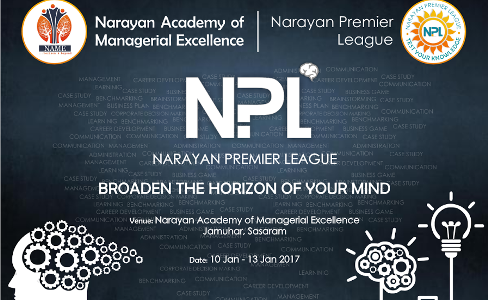 Narayan Premier League, a 4 Days Quiz Competition from 10th Jan to 13th Jan 2017 was organized by the MBA Students of Narayan Academy Of Managerial Excellence . The aim of the league was to provide future professionals a platform where they shall be able to showcase their skill through fun and learning combination of events. In total, 35 MBA students participated in this year’s Narayan Premier League. The event started with participants divided in two groups, Group A in Hall-1 and Group B in Hall-2. After warm up rounds on the first day, the elimination began on the second day and continued till 3rd day of event, there were several Rounds with short breaks and finally we came up with 2 finalists for the Finale on 13th of Jan. There was a lot of pressure in the final round, going head-to-head with each other, the two finalist stretched their brain nerves to the last extent. There was a tie between the two after the final round, but in the Tie-breaker round Varsha Rani hit the Bulls Eye and won the First Narayan Premier League. The quiz is a real test of intelligence, skill and nous and there was a lot of interest from the students to participate in the quiz, so the College is looking forward to great event next year.